Hercules caught a pigeon shortly after I arrived this morning. She took it to one of her favorite eating perches and the feathers started to fly. She ate there for about 15 minutes. If you click on the picture for the larger version, you can see the feathers flying in a halo around her. Sometimes, this is what actually alerts me first to either falcon’s location. On Eating: There seems to be some disagreement as to how effective the stoop attack is in killing prey straight out. I will do some more research over the winter and, hopefully, come into next season with far more knowledge on many fronts. From what I’ve read so far, the peregrine grab the prey with their feet, but do not skewer them with their talons, as accipiters do. Instead, the peregrine bites into the prey’s neck – as I’ve mentioned time and again. What I didn’t know is that sometimes peregrines do that in the air, as they fly to a preferred eating perch. Mostly, I’ve seen Max and Herc come in with intact birds. After landing, they bite the head off. So, that may be an individual thing. 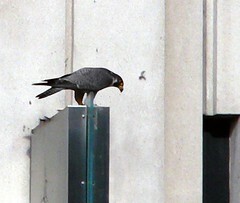 Peregrines do seem to favor particular perches for plucking and eating. After landing, typically they tear off the head. If its a small bird, usually the head is consumed. 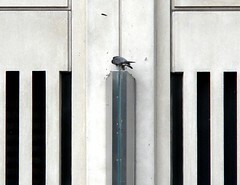 If the peregrine has a particularly strong morbid sense of humor, like the MCC birds, they forgo the delicacy in order to drop the head on unsuspecting human commuters below. The prey almost always are well-plucked. Really, really, really well-plucked. I’m not kidding on this. After plucking, they consume the neck, then move to the breast. If the prey is large, oftentimes they detach the posterior half of the carcass from the breast and take that to the nest instead of the whole bird. Hence – the Half Bird. So, Hercules ate with gusto and then tossed a few scraps, including the head, over the side, watching as they fell to the sidewalk below. By the time I got down there, an hour later, the pieces were gone, so I couldn’t collect them. That’s alright, though, as I trusted my ability to identify a pigeon and could safely jot that down. Hercules took off with half the pigeon (posterior half) to the nest. About halfway there, Max came down from the skyscraper perch and flew with her to the nest. The two vocalized the whole way and finally landed on the nest ledge. Hercules put the pigeon down, Max picked it up and then dropped into the nest with it. Hercules promptly took off and flew east, towards State Street. Twenty minutes later, Max hopped up onto the ledge from the nest and flew to the skyperch. A bit later, Hercules came back from the east empty handed (or taloned, if you will), but on her way to join Max on the skyperch, a very small bird, sparrow by the looks of it, happened into her path. She went into a crazy aerial chase, finally driving the bird into the skyscraper window and snagging it when it fell. Max jumped off the skyperch and the two careened back to the nest together, vocalizing wildly. Again, Hercules stepped away from the kill and Max took the entire thing into the nest. James and Tom came up to visit just as I was packing up. They got to see Hercules catch the sparrow and both falcons head back to the nest at mind-blowing speeds while making tons of noise. Both men were really excited to tell me all about what they’d seen on breaks — mostly hunting stories and spectacular high dives. I talked to them a bit about how we might get onto the top of the stairwell roof and bag the remains up there. While neither of them seemed keen on allowing me up there (insurance reasons, I’m sure), they started to plan together how they would do so. If they have time, some time today they will go up on that roof and sweep everything up there into a bag for me. I’ll bring it back to the museum, go through it and try to identify what I can. It’s really neat to have some enthusiastic assistance from the building staff and certainly makes me feel much less nervous that I’m going to suddenly lose my access to such a prime viewing spot. ~ by Steph on May 18, 2006.